Results: An international team of climate scientists including Pacific Northwest National Laboratory's Richard Moss, Jae Edmonds, Kathy Hibbard, Steve Smith, and Allison Thomson have designed a new approach to modeling the Earth's climate future. The approach is described in the journal Nature and will more tightly link analyses of greenhouse gas emissions, projections of the Earth's climate, impacts of climate change, and human decision-making. The new approach will influence the next international scientific assessment undertaken by the Intergovernmental Panel on Climate Change (IPCC) and provide a new framework for thousands of individual scientific studies on climate impacts and adaptation, climate modeling, and changes in the way societies generate and use energy. "This is an open-ended approach that enables us to compare the environmental and socio-economic effects of different potential responses to climate change," said lead author Dr. Richard Moss, who performs climate change impacts research at PNNL's Joint Global Change Research Institute in College Park, Maryland. "This comparative evaluation is extremely important to determine the technical, policy, and economic requirements for reaching whatever society decides is a safe level of climate change. We hope to provide decision-makers with better tools to help people deal with a shifting climate." Why it matters: Understanding the impacts and interactions of activities such as increasing energy efficiency and conservation, developing new renewable fuels to replace fossil-based fuels, and planning how land is used is crucial to better decision-making. An essential aspect of the new climate analysis process is the integration of different types of computer models and studies. This is possible because of the open-ended nature of the process and a new sequence for research: rather than treat each problem in a linear fashion, researchers will work to integrate the models to study interactions of human and natural influences on climate. Climate model and socioeconomic data will be available more rapidly to those modeling the potential impacts of climate change. Researchers will be better able to diagnose how different groups of models treat feedbacks—such as additional releases of greenhouse gases from ecosystems—that have the potential to further amplify climate change. Methods: The process begins with four possible representative climate futures defined by ‘radiative forcing'—how much of the sun's energy the atmosphere retains (these are referred to as ‘representative concentration pathways', or RCPs). The climate futures represent a very broad range of potential future climate change and are intended to become standard scenarios for future generations of climate model experiments, thus promoting comparison of results over time as climate models themselves are improved. The RCPs were selected through an open, international process that included an IPCC expert meeting and open peer review by modeling groups. The RCPs will be used to initiate climate modeling and provide a general framework for development of socio-economic scenarios which will be paired with the climate model results and used to study climate change impacts, adaptation, and mitigation. What's next: Many independent groups of scientists will use the RCPs in climate models. In addition to focusing on the usual century-long time scales typical for climate studies, one set of experiments will focus intensively on one pathway over the next few decades to provide better information on regional changes and extreme events, thus aiding decision-makers in planning adaptations to new, imminent conditions. This is possible because the pathways do not diverge significantly until 2035. In parallel with development of climate scenarios, new socio-economic scenarios will be developed through an open process to explore important socio-economic uncertainties affecting both adaptation and mitigation. Development of the new scenarios relies on the observation that many different human futures could produce any particular forcing pathway or RCP. Integrated assessment modelers, such as those at PNNL's JGCRI, will research the implications of how different scenarios of population and economic growth, technology futures, and policies influence emissions of pollutants and activities that cause climate change. In addition, working with climate impacts researchers, they will study how different policies and conditions increase or decrease vulnerability to climate change. "We wanted to explore how environmental and social vulnerability would evolve and the resources needed to reduce the impacts of now unavoidable levels of climate change," said Moss. View the full paper, listen to Nature's "Climate research: the next generation" Feb. 11 podcast featuring Richard Moss, and view the press release here. Acknowledgments: PNNL is transforming the nation's ability to predict climate change and its impacts. This work was supported by the Department of Energy's Office of Science and many other funding agencies. The Joint Global Change Research Institute is a unique partnership formed in 2001 between the Department of Energy's Pacific Northwest National Laboratory and the University of Maryland. Reference: Moss RH, JA.Edmonds, K Hibbard, M Manning, SK Rose, DP van Vuuren, TR Carter, S Emori, M Kainuma, T Kram, G Meehl, J Mitchell, N Nakicenovic, K Riahi, SJ Smith, RJ.Stouffer, A Thomson, J Weyant, and T Wilbanks. 2010. 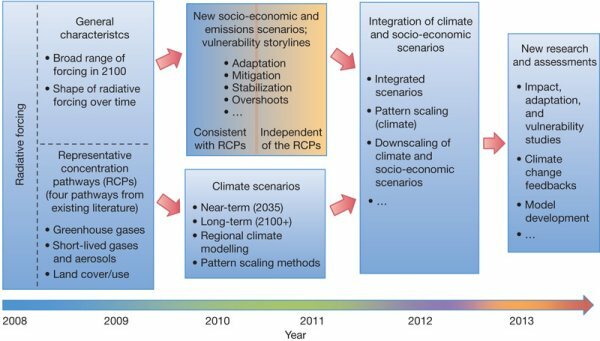 "The Next Generation of Scenarios for Climate Change Research and Assessment." Nature, 463:747-DOI:10.1038/nature08823.